Hello and welcome to our summer newsletter! It has been a busy and active few months for Circle. 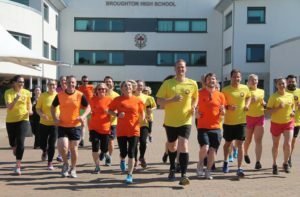 We are delighted to be taking part in The DARED Challenge, which is to Do a Run Every Day in June. This is an initiative which came from Mark Fletcher who is a teacher at Broughton High School. Mark was keen to encourage people to become more active and at the same time raise money for Circle. Mark has managed to inspire over 150 staff from 30 schools across Edinburgh, as well as family, friends and a few Circle staff to become involved. So far over £6,000 has been raised and if you would like to sponsor us we would be grateful. A big thank you to Mark and to everyone taking part and for your enthusiasm and support of Circle. Below is a photo of some of us warming up for the challenge together! We now have a date for Circle’s Annual Lecture which will take place on 11th October 2018 at 6pm. George Heriot’s School is kindly sponsoring the night and the theme will be Year of Young People. Please save the date and we will send out more details soon. Also as part of our activities for Year of Young People, the children from our ISSEP Mentoring Project have been photographing their experiences of their time in the project. These amazing photographs along with the children’s powerful comments and feedback are currently being exhibited at North Edinburgh Arts Centre. If you would like to see the children’s work, please pop along. The exhibition was very well received at our ISSEP end of term celebration last week. We are pleased to have secured a fathers worker post for our Harbour Project through Corra Foundation. Pete Cloke, who previously worked with our Haven Project, has taken up this three year post. We are grateful to Corra Foundation for funding this work. Lyndsay Fraser-Robertson has been sharing the findings from her Winston Churchill Travelling Fellowship. Lyndsay found that mothers affected by substance use are better served by services which allow them to stay with their children. She was particularly impressed by services that provided intensive parenting interventions alongside treatment. Amongst other opportunities, Lyndsay has delivered her presentation at the Drug, Alcohol, Women and Families 2018 conference in Manchester. Well done Lyndsay! We have been lucky enough to have two events involving the Scottish Parliament’s Justice Committee. We were initially asked to give evidence to the Justice Committee alongside four other voluntary organisations. This was on the topic of remand and we were able to answer questions and give suggestions around alternatives to remand and the role the voluntary sector could take in providing this. Following on from this, eight members of the Justice Committee visited Circle and we were able to spend time with them to showcase the work of the Families Affected by Imprisonment Team (FABI). The Committee members showed a great deal of interest and we would like to thank them for taking time out of their busy diaries to hear about our work. I hope you enjoy the newsletter and, as always, if you have any questions or would like to get more involved with our activities, please do get in touch.